An eruv is an urban area enclosed by a wire boundary that symbolically extends the private domain of Jewish households into public areas, permitting activities within it that are normally forbidden in public on the Sabbath. Some may think that an eruv (pronounced ay-roov) has something to do with baby strollers—and to a certain extent they are right. Actually, an eruv, in modern terminology, is a technical boundary that allows Jews to carry in public areas on Shabbat. It is one of those traditions which has blossomed from a basic Torah principle into a highly complicated legal matter. The border of the East Denver Eruv are complicate but roughly borders 13th on the north, Colorado on the west, Cherry Creek on the south, and Quebec on the east. 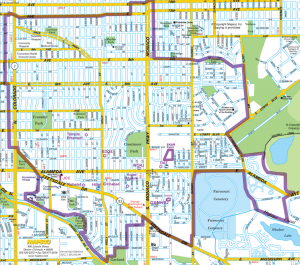 You will find an exact map of the East Denver Eruv at http://www.denvereruv.org/map.html . You can find even more information about the East Denver Eruv at http://www.denvereruv.org . Below you will find the most recent homes listed for sale in the East Denver Eruv . You can see all homes for sale in the East Denver Eruv at http://tinyurl.com/DenverEruv.